11/01/17 By Gary M. Baranec Hollidaysburg girls celebrate their win over Somerset Wednesday at Altoona's Mansion Park. When it comes to district championships, winning one is great, but winning two is even greater. 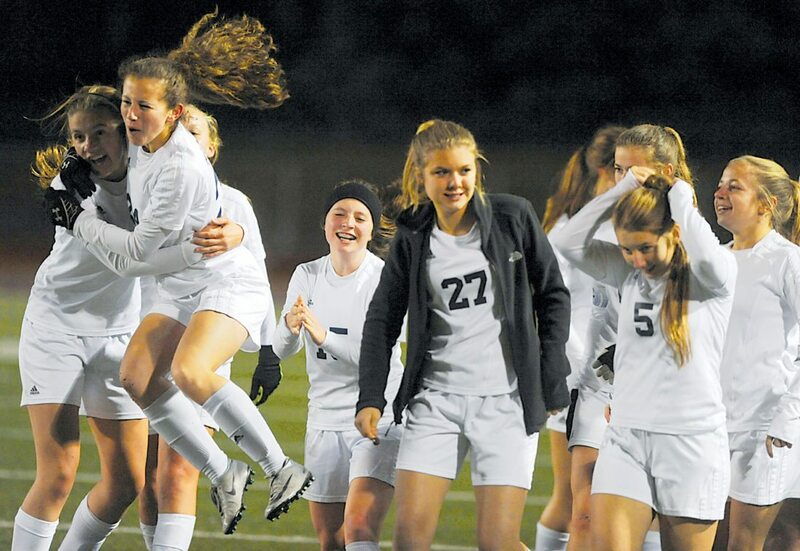 That was the collective chant of the Hollidaysburg Area High School girls soccer team Wednesday night, after the Lady Tigers defended their District 6 Class 3A title with a hard-fought 1-0 victory over Somerset under damp, chilly conditions at Mansion Park. Hollidaysburg (15-4-1) scored the only goal of the game with just seven seconds remaining in the first half. Senior center-midfielder McKenna Hurd scored the goal, taking a pass from senior forward Sydney Routch and kicking a shot into the lower left corner of the cage past Somerset junior goal keeper Courtney Vought. Routch found herself free with the ball while rushing down the right side of the field, before connecting with Hurd on a crossing pass toward the middle of the field. Vought had come out of the cage to try cut down on Routch’s angle, but left the charging, sliding Hurd with more than half an open cage in which to kick the ball. Routch said the goal came about as the result of a designed type of play. Routch and Hurd were both ecstatic about the Lady Tigers’ title defense. “It’s absolutely good to defend the title, win it again, so that our underclassmen can have the chance to keep the streak going next year,” Routch said. Hurd said that defending the championship was a huge thrill for her and her teammates. On a night when much of the play was in the middle of the field and quality shots on goal weren’t easy to come by for either team, one goal made all the difference. Hollidaysburg outshot Somerset, 8-6 for the game, and generally controlled the first half, with Vought making a nice sliding save on a breakaway try by Routch 10 minutes into the game. Somerset enjoyed a general territorial edge in the second half, with Hollidaysburg sophomore goal keeper Meghan Cutshall making a fine save about 26 minutes into the half. Cutshall also stopped senior Mia Dirienzo’s free kick with about two minutes remaining in the game. “In the second half, I thought we controlled more of the pace,” said Somerset coach Alejandro Bastidas, whose team finished the season with a 14-6 record. “Hollidaysburg is a good team that played hard the entire time, and our girls fought hard all the way to the end. Hollidaysburg now moves on to the PIAA state tournament and a game next Tuesday against the WPIAL champion at a time and site to be determined. On Wednesday, though, the Hollidaysburg team was able to take time to savor its well-deserved moment of glory. “It feels surreal that we could do it twice in a row,” Routch said. Hurd captured the sentiment best. “I don’t think it could get any better than this,” she said. First half: 1, H–Hurd (Routch), 39:53. 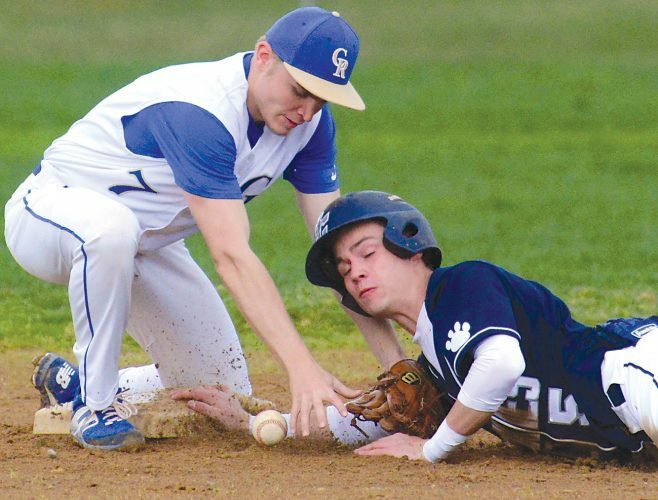 Records: Somerset (14-6); Hollidaysburg (15-4-1). Shots on goal: Hollidaysburg 8 (Vought seven saves); Somerset 6 (Cutshall six saves).